The SmartLink Therapy Management system consists of the SmartLink Module and SmartLink Software Package. Together they provide a simple means of monitoring and recording CPAP usage and evaluating the effectiveness of CPAP therapy. The SmartLink module is a device which attaches to the back of any model in the SleepCube range. 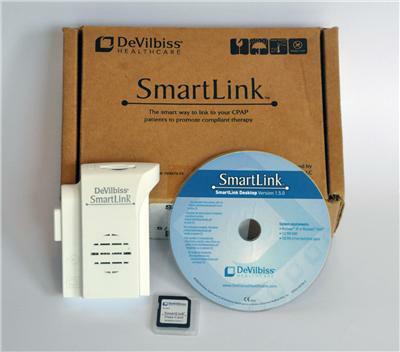 It records and stores patient data, which can then be transferred via direct device download or SD card and card reader to the SmartLink Desktop Software Package. This allows the physician to analyse and monitor patient compliance data and evaluate the effectiveness of treatment. In addition the SmartLink module also offers the possibility of adding a pulse oximeter for measuring SpO2 and pulse rate values. Up to 3 years of basic compliance data can be stored using SmartLink. When attached to a SleepCube Auto, up to 120 days of detailed therapy data can be collected, giving all the parameters needed for overnight assessment or titration purposes.